Gifts from the Pirates: "My theory in anything you do is to keep exploring, keep digging deeper to find new stuff." "My theory in anything you do is to keep exploring, keep digging deeper to find new stuff." A month or so back i was looking for ideas for garden furniture as we've not really done a lot with ours since moving in back in December. We really needed somewhere to sit out there and i didn't really want to spend a lot. I ended up on Youtube and came across lots of videos on how to make garden furniture using pallets. Its important to know that although i can create all sorts using the medium of LEGO, when it comes to DIY, woodwork or the use of power tools I'm pretty useless. Despite this I politely asked a couple of friends if they could get hold of some pallets for me so i could attempt some garden chairs. Sadly there wont be any pictures of the chairs in this post as although they are built and sanded, they are yet to be painted and covered, stay tuned though. This novice building in the back garden left a great heap of scrap wood which was sitting in the corner of the garden waiting to be shipped off to the recycling centre. As we were leaving West Midlands Safari Park a couple of weeks ago, Seth said "I really enjoyed the Dino Dig, could you make us one with the wood in the back garden please?". Well I've never been one to pass up a challenge and I try to embrace every idea that the boys come up with as much as I can so last week we set Seth's big idea in to motion. We pulled all the wood apart and Seth this time round was more than just a foreman, he got his hands dirty and was loving bashing the nails in. we made a large square box and painted it bright green, lined it with dark green tarpaulin and then cut out some spikes for a stegosaurus effect (nice idea by the boys and was a great touch). Not at all bad considering all we did was recycle some scrap wood from the garden. 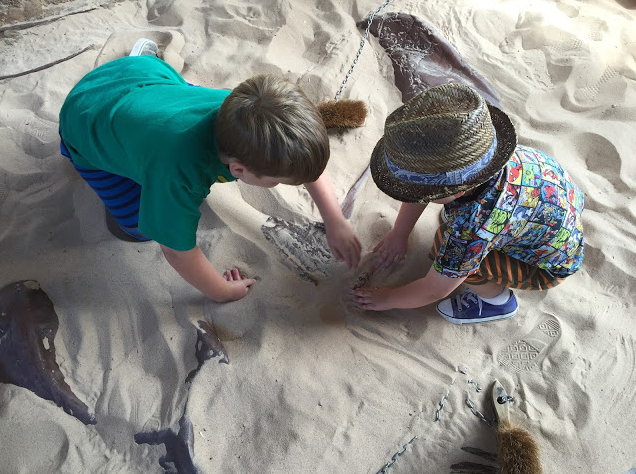 I'm yet to put legs on our 'Dinosaur excavation pit' but the boys couldn't wait to fill it up with sand and start their new career in paleontology. The boys had a selection on dinosaurs to start with and thanks to our friend Chris giving the boys a great Fossil that also added to the fun. A few days back i found some small toy dinosaur skeletons online so I got those for the boys and hid them in the pit for when they were playing a couple of days ago. It was lovely seeing their surprised faces when they uncovered the new skeletons and they loved carefully brushing off the remains and preparing them for their imaginary museum. I'm going to be making molds of bones next after me and Opeie watched a documentary about archaeology. The small dinosaur skeletons are great for a bit of fun but i wanted something a little more interesting for the boys so I've ordered a 1/6 Scale resin dinosaur skull for them to unearth, if it as interesting as i am hoping then i think there is going to be lots of fun and fascinating things being unearthed in this new found interesting geological area.